The cut surface of desmoid-type fibromatosis is firm, white, and whorled. 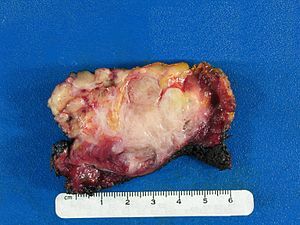 The white tumor infiltrates the adjacent skeletal muscle (red tissue - lower left) and fat (yellow tissue - upper left). This tendency for invasion of adjacent normal tissues and structures is the reason that desmoid-type fibromatosis has a relatively high rate of local recurrence, even after surgical removal. The term fibromatosis refers to a group of soft tissue tumors which have certain characteristics in common, including absence of cytologic and clinical malignant features, a histology consistent with proliferation of well-differentiated fibroblasts, an infiltrative growth pattern, and aggressive clinical behavior with frequent local recurrence. It is classed by the World Health Organisation as an intermediate soft tissue tumor related to the sarcoma family. Fibromatosis colli: Non-neoplastic sternocleidomastoid muscle enlargement in early infancy. Does not generally require resection and responds well to physiotherapy. Treatment is mainly surgical; radiotherapy or chemotherapy is usually an indication of relapse[clarification needed]. Head and neck desmoid fibromatosis is a serious condition due to local aggression, specific anatomical patterns and the high rate of relapse. For children surgery is particularly difficult, given the potential for growth disorders. Treatment includes prompt radical excision with a wide margin and/or radiation. Despite their local infiltrative and aggressive behavior, mortality is minimal to nonexistent for peripheral tumours. In intra-abdominal fibromatosis associated with Familial adenomatous polyposis (FAP), surgery is avoided if possible due to high rates of recurrence within the abdomen carrying significant morbidity and mortality. Conversely, for intra-abdominal fibromatosis without evidence of FAP extensive surgery may still be required for local symptoms, but the risk of recurrence is low. Other names include "musculoaponeurotic fibromatosis," referring to the tendency of these tumors to be adjacent to and infiltrating deep skeletal muscle, aggressive fibromatosis and "desmoid tumor." A clear difference should be made between intra-abdominal and extra-abdominal localizations. Fibromatosis is a different entity from neurofibromatosis. ^ Wilkinson MJ, Fitzgerald JE, Thomas JM, Hayes AJ, Strauss DC (2012). "Surgical resection for non familial adenomatous polyposis related intra-abdominal fibromatosis". British Journal of Surgery. Semantic Scholar. 99 (5): 706–713. doi:10.1002/bjs.8703. PMID 22359346. This page was last edited on 5 December 2018, at 01:06 (UTC).